The prize, one of the most prestigious honours for living British writers, has been won in the past by Heaney's fellow Nobel laureates VS Naipaul and Harold Pinter. It is awarded biennially for a lifetime's excellence in literature. The prize is unusual in that the winner receives a further £12,500 to be donated either to a literature organisation that supports young writers, or to an individual writer under the age of 35. Heaney chose to give the £12,500 to an annual poetry speaking competition open to all post-primary students in Ireland, Poetry Aloud. 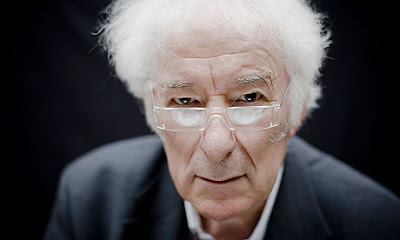 On receiving his prize this evening at a ceremony at the British Library, Heaney said the award was "highly honorific". "First of all there's the list of the previous winners, a roll call of the best; there's the fact that you don't enter for it but are chosen from the wide field of your contemporaries; and then there's the verification of that reference to 'lifetime achievement'", he said, calling it "a lovely reward when offered by a panel of such distinguished writers and readers". Motion admitted that Heaney's reputation as Nobel laureate, bestselling poet and "venerated public figure" meant that "judging panels might be expected to feel some trepidation about bestowing another prize on him". But the David Cohen prize judges, who also included novelist Rose Tremain, poet and critic Robert Crawford, Guardian journalist Maya Jaggi and Malawian poet Jack Mapanje, felt that the "self-renewing force of his writing, and the sheer scale of his achievement", made the award of the prize "an absolutely right and proper act of recognition". This entry was posted on 3.20.2009 at 9:41 a. m.. You can skip to the end and leave a response.